Dave Lindberg's recently published paper (Estes et al. 2005) is straightforward paleobiology: several lines of evidence suggest that abalones evolved larger body sizes in association with kelp ecosystem expansions during the late Neogene cooling of the North Pacific. But tracing the threads of this research back to their roots leads to some unexpected places. It all started 25 years ago with an oil spill in the San Francisco Bay and an otter protection plan…. Kelp, a fleshy marine alga, hasn't left much of a fossil record; the "fleshy" descriptor is a dead give away: no hard parts means improbable fossilization. However, abalones and other species associated with kelp may provide clues to kelp's evolutionary history. 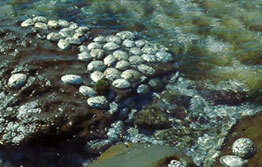 Dave and his colleagues used abalones to investigate the hypothesis that kelp radiated extensively after late Cenozoic cooling, triggering evolutionary changes in abalones. They found that large abalone species are associated exclusively with cold water kelp forests, suggesting that large abalones are good indicators of kelp ecosystems. Additionally, examination of fossil abalones suggested that large species appeared concomitant with cooling in the late Cenozoic. Finally, phylogenetic analyses showed that this evolution of large-bodied abalones occurred in two separate lineages during separate cooling periods—one in the northern hemisphere and one in the southern. The findings supported the idea that cold water kelp facilitated evolutionary change in abalones. "The otter story started too many years ago. As a graduate student, I was working with Jim Estes [co-author on the paper] and got a chance to work on San Nicolas Island [in Southern California] as part of the sea otter translocation…. For any species that is listed as endangered, threatened, or impacted, there must be a plan for restoring its population numbers. So in the late 70s, it occurred to people that, given the impact on sea otters, we needed some way to increase the population—or have two populations in case one got hit by an oil spill.